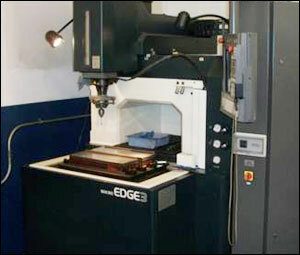 In 2006 Vision Custom Tooling, Inc. moved onsite in the same building as KER. They provide a number of tool & die services, but namely build injection molding tools. They are an extremely reputable company with a track record of the highest caliber work and employ highly trained journeymen tool and die makers, capable of building simple to very complicated tools. For more information visit their website at www.visioncti.com. Having this turnkey capability with Vision Custom Tooling helps our customers in a number of ways. First, your tool can be built and run in the same building. There are no transportation costs, risks, or even lost time. Furthermore, trial runs are very quick with product manufactured the same day the tool build has finished. Lastly, Vision Custom Tooling offers prompt and effective repairs on any tools that are run at KER. Again, this relationship produces efficient repairs to prevent any impact on delivery dates and eliminates any transportation time and cost.